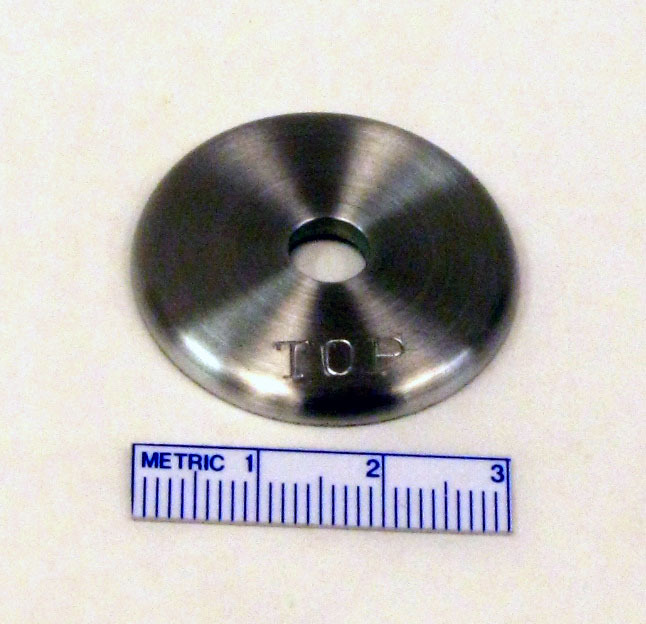 The width of the "Taber Test" wear path is 12.7 mm, and located 31.75 mm from the center of the specimen. For most rigid materials, a sample approximately 100 mm square is recommended. If the specimen is less than the suggested size, it is possible to position two or more specimens on a mounting card to meet the size requirement. If the edges are not flush together or if the samples are of different thickness, the edges may wear at a different rate than the rest of the specimen. 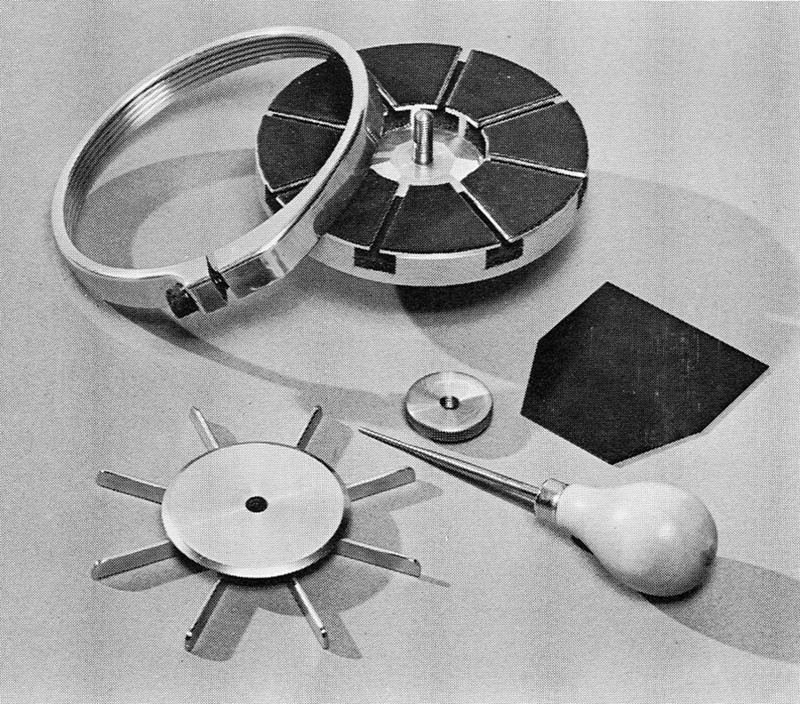 Flexible specimens are typically circular and require the use of the clamp ring. 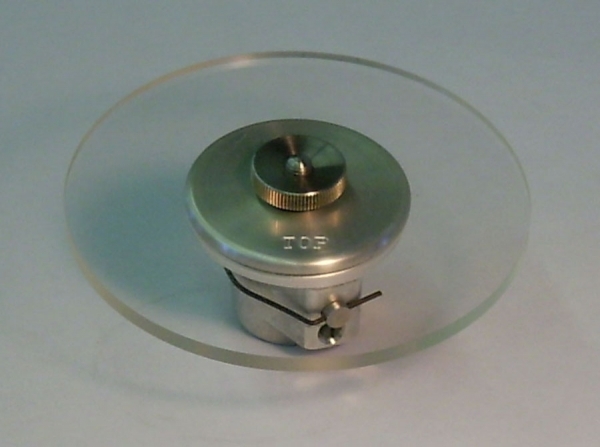 If a mounting card is used, the specimen should be approximately 108 mm in diameter. 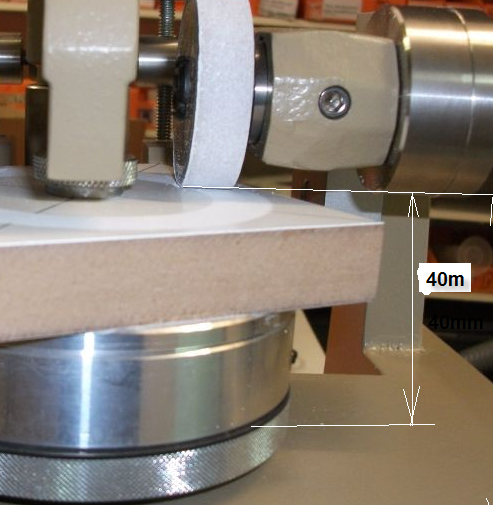 If no mounting card is used, a 135 mm specimen is required such that the clamp ring will grip the overlapped material. 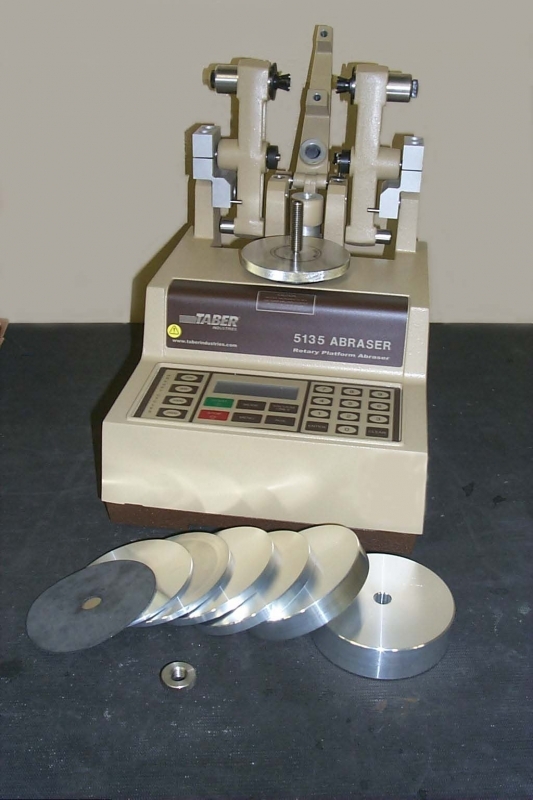 To expand the versatility of the Taber® Rotary Abraser (Abrader), mounting options and interchangeable specimen tables are available to evaluate materials not easily tested with the standard configuration. 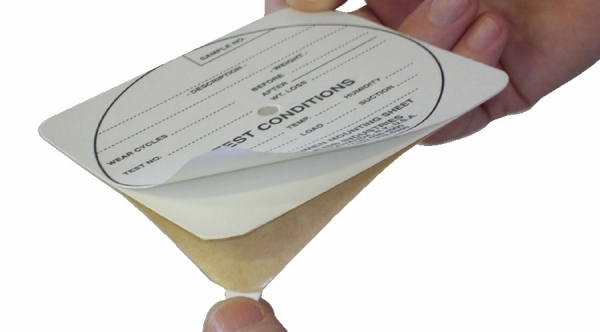 When testing textile and other flexible test specimens, a Mounting Card may be useful to prevent wrinkling while undergoing testing. Made from rigid card stock, mounting cards are coated on one side with pressure sensitive adhesive to affix to the specimen. A test record form is printed on the backside for permanent record of the test. 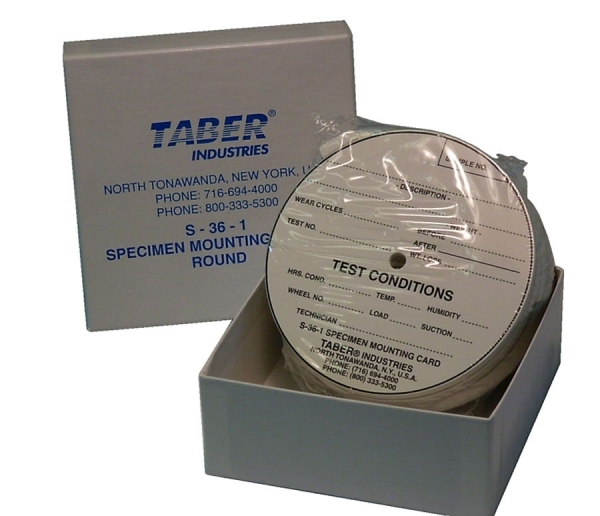 Taber mounting cards are available as square (S-36) or round (S-36-1). Mounting Sheets are coated on both sides with pressure sensitive adhesive. 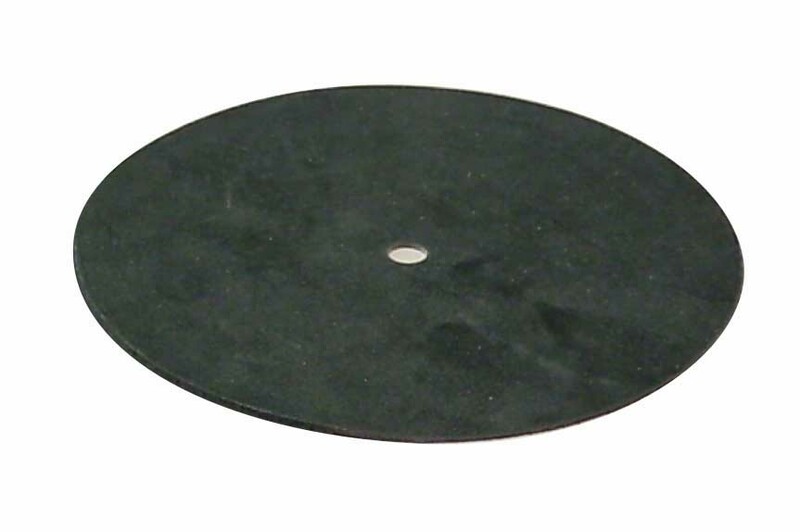 Used to provide a non-slip attachment of the specimen to the surface of the turntable, mounting sheets are especially useful for materials difficult to drill a center hole (such as glass or ceramics). Mounting sheets are available as square (S-37) or round (S-37-1), and have a test record printed on both sides enabling them to be used as a mounting card. 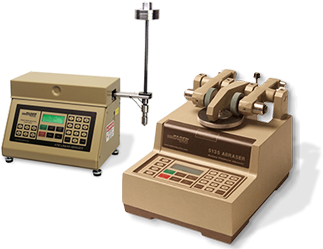 The specimen table (E100-125) equipped with the Taber Rotary Abraser has been designed to accommodate most materials less than 6.35 mm thick. A 6.35 mm center hole must be punched or drilled in the specimen so it can be securely fastened to the threaded center post. To secure rigid materials, use the clamp plate and nut. 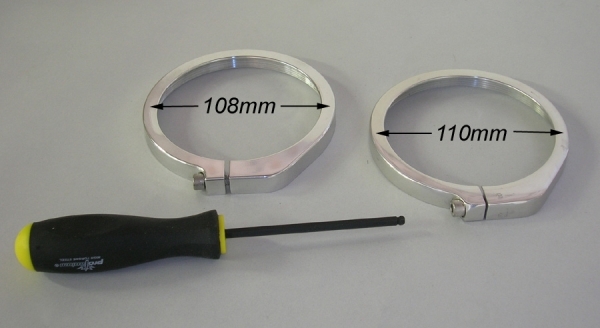 For flexible materials, also use the supplied E100-101 specimen clamp ring. A replaceable rubber pad (S-19) is provided to ensure a non-slip surface. All Taber Abraser specimen tables are engineered with a ball plunger and drive pin spring clutch that locks the table onto the motor shaft. 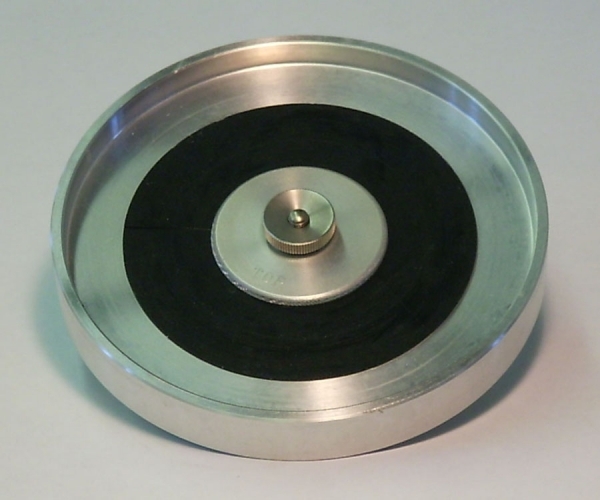 This prevents the table from shifting during a test, but allows for it to be easily removed for specimen inspection or to clean the motor shaft cavity. Specimen Holder with Ring Clamp (E140-14) - Used with rigid specimens that are slightly warped, and less than 6.35 mm in thickness. Eight (8) screws are spaced evenly on the clamp plate, and when tightened, will correct for slightly warped conditions. This holder can be furnished with (E140-14-S) or without (E-140-14-NS) a center clamping screw. Specimens should be 137 mm in diameter with a 6.35 mm center hole. Textile Specimen Holder - Tensioning Type (E140-15) - Similar to the standard specimen holder but with a raised wear track. This gives textile or other flexible material additional tension when the clamp ring is drawn down over the edge of the holder and the clamp plate is tightened in the center recess. 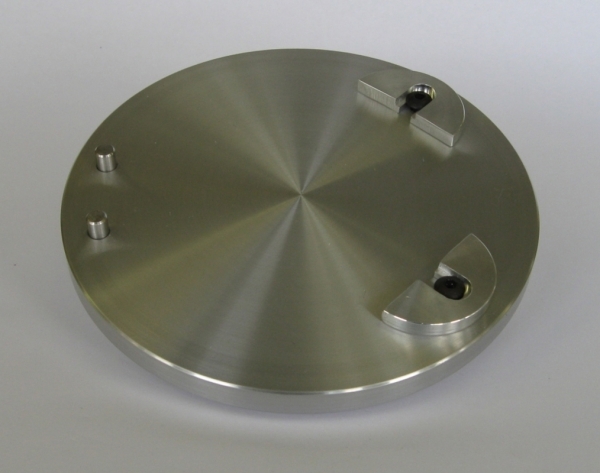 Requires a 134 mm diameter specimen with a 6.35 mm center hole. This holder is not recommended for use with rigid specimens or with mounting cards. Textile Specimen Holder - Tensioning Type for Wet or Dry Testing (E140-18) - Designed to give an initial stretch to woven fabrics so that they may be tested while moist with minimum tendency to wrinkle. A raised wear track provides additional tension on the specimen, while a 9.53 mm rim helps retain any liquid. Requires a 159 mm specimen with a 6.35 mm center hole. Drive Pin Type Holder (E140-19) - Intended for rigid, square specimens that do not have a center-mounting hole. One corner of the specimen is positioned between two pins while two adjustable clamps are used to secure the specimen in place. This prevents the specimen from slipping while the test is being conducted. Threaded Ring Specimen Holder (E140-21) - A clamp plate and flanged clamp ring are incorporated to test slightly warped, rigid specimens. The ring is threaded to the body of the holder, which securely clamps the outer edges of specimens up to 137 mm diameter. 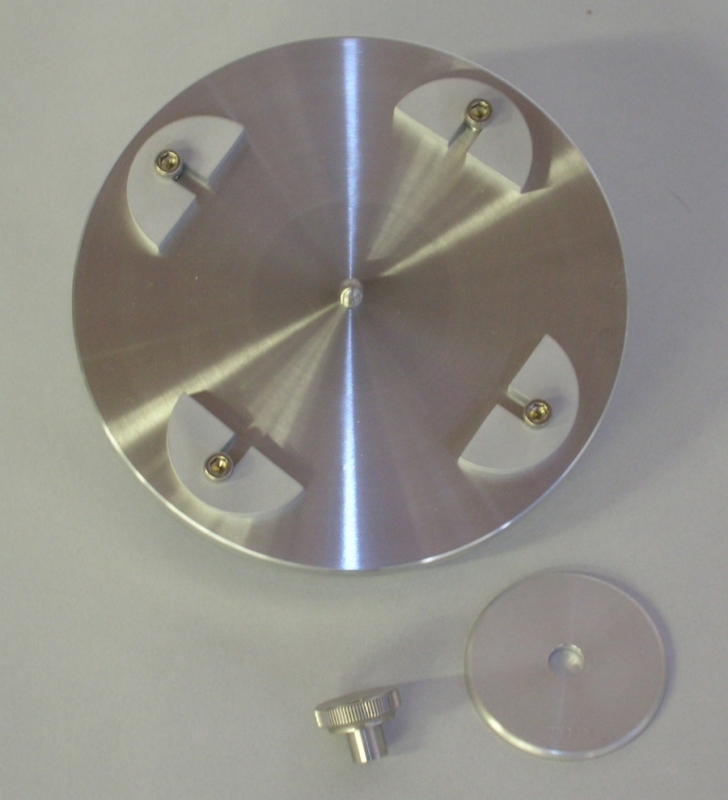 Rimmed Specimen Holder (E140-75) - Includes a 7.5 mm raised rim for retaining liquids during a test. A rubber pad is adhered to the table to prevent specimens from slipping during the test. This holder is used for wet testing materials to determine the effect of absorbed and / or surface moisture on abrasion resistance. To prevent splash over on the instrument, use only a sufficient amount of liquid to cover the specimen. Specimens may be up to 140 mm diameter. Specimen Holder with Transparent Base (E100-10) - Manufactured with a transparent base and recommended to be used with the E100-102 clamp ring. When evaluating textile specimens, the table may be removed from the Abraser to view the abraded specimen against a strong light source to determine the worn condition of the threads. This eliminates the need to remove the specimen from the holder permitting the test to be continued if desired. Multiple Specimen Holder (E3945) - Divided into sections, this specimen holder permits eight samples to be tested simultaneously for quick comparisons. Intended for nylon hosiery and lightweight fabrics, the normal test load used with this table is 125 or 250 grams. A template is provided as a guide to cut specimens to the proper size. Sliding Mount Specimen Holder - This holder is designed to test small, rigid materials. With two adjustable slide mounts, four 50 mm square samples can be mounted to this table. To accommodate the threaded center post, one corner of each specimen must be trimmed. Clamp Plate - 1 1/4" Diameter - When using the Scuffing Attachment to test carpeting and other floor covering materials, a smaller diameter clamp plate 31.75 mm is available. The smaller diameter helps to prevent crushing of the specimen fibers near the wear path. Clamp for CD/Blu Ray Discs - Permits mounting of CDs, DVDs, and Blu Ray Discs to the Taber Abraser. 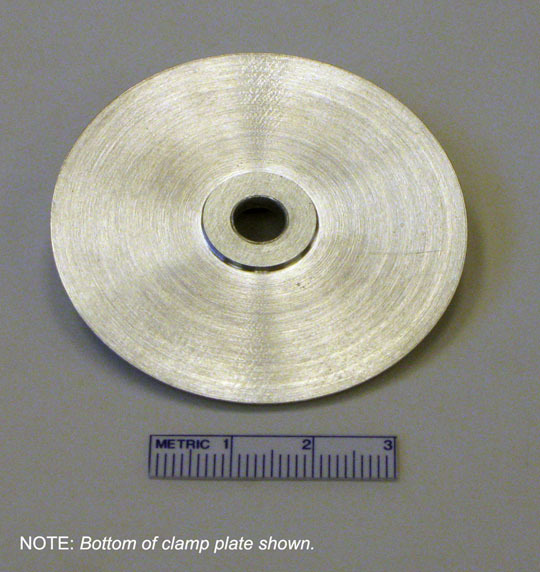 The clamp plate has a 0.75 mm raised shoulder that is approximately 15 mm in diameter to ensure the disc is secured to the center of the specimen holder. 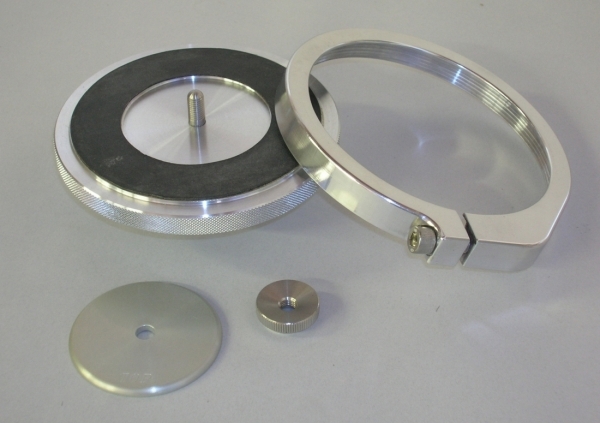 Specimen Clamp Rings - Two specimen clamp rings are available for the Taber Rotary Platform Abraser. 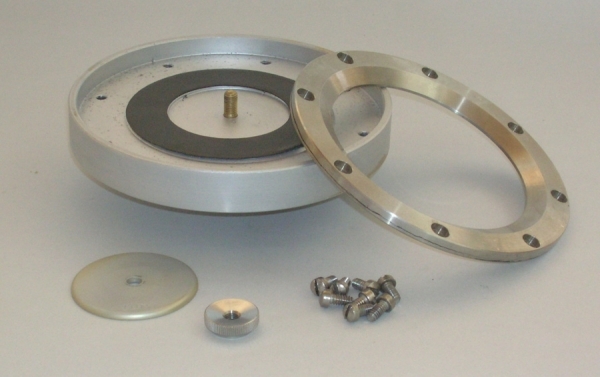 The standard clamp ring provided with the instrument is Model E100-101. This has a 108 mm I.D. and is designed for flexible materials up to 0.79 mm thick. With a 110 mm I.D., model E100-102 will accommodate flexible materials up to 1.59 mm thick. E100-102 is also referenced as clamp ring "B". 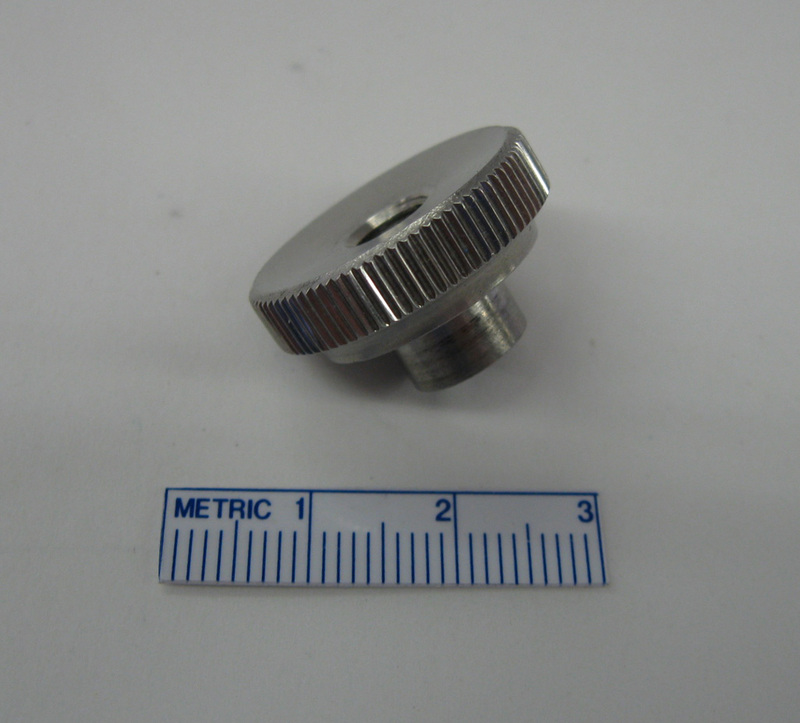 Extension Nut (S-21) - To secure specimens that are 6.35 mm to 12.7 mm thick, the S-21 extension nut should be used. A 9.5 mm center hole must be drilled into the specimen to accommodate the longer shoulder. This kit was engineered to accommodate specimens that exceed the 12.7 mm thickness (up to 40mm). This kit raises the position of the abrader arms and allows for the correct alignment and positioning of the abrasive wheels. 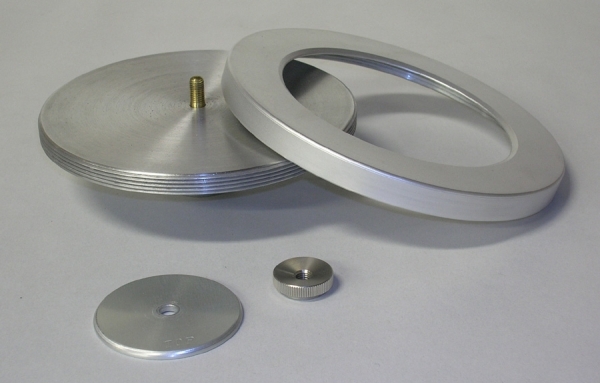 An extension post is threaded to the turntable and by using the appropriate combination of turntable shims, the proper arm position relative to the specimen can be maintained. Intended for rigid materials, a 13mm center hole must be drilled in each specimen. 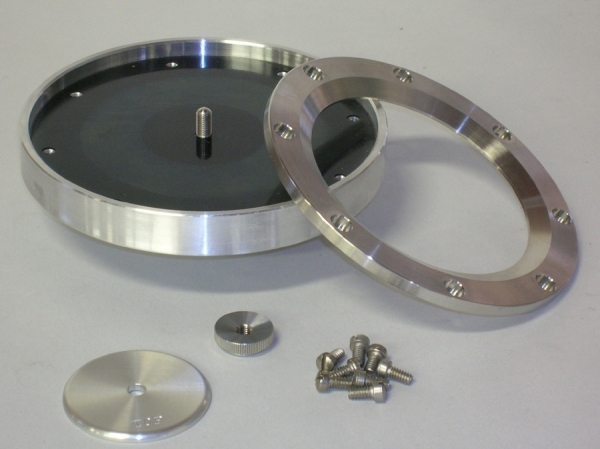 Kits are available for Taber Abrasers with single or dual turntables and include the arm height extenders, turntable adaptor and a set of 6 shims. * It is necessary to return your instrument to Taber Industries for installation and calibration.